Join ESF | "The Voice of the European Services Sectors in International Trade"
"The Voice of the European Services Sectors in International Trade"
Join a well recognised interlocutor and benefit from the network’s excellent relations with the EU trade negotiators. 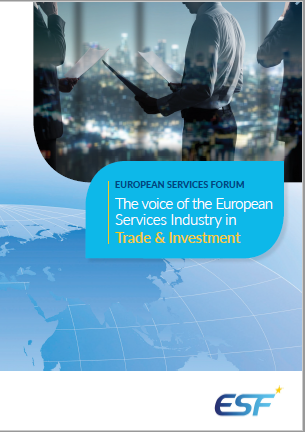 A single-issue organization with broad membership covering a very large range of services sectors, ESF is recognised by the European Commission and the European Union Governments as the Voice of European service industries for the liberalisation of services. 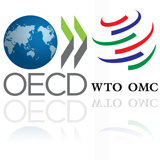 ESF was selected as one of the ten Non-Governmental Organisations (NGO) to be part of the Official Delegation of the European Commission for the WTO Ministerial Conferences in Seattle in 1999, in Doha in November 2001, in Cancun in September 2003 and in Hong Kong in December 2005. As a business NGO, the ESF team has observer status and is directly briefed and consulted by EU Trade Commissioners. The EU Member States’ services trade negotiators, gathered in the so-called “Article 133 (Services) Committee” hold regular meetings with ESF members, allowing them to receive direct input from the entire services industry in one meeting. These meetings are organised every six months with the EU Presidency in office. This Committee is not just a consultative committee, but a decision-making committee. Joining ESF would allow you to benefit from the excellent relationship between the organisation and the trade negotiators from the EU Institutions and the EU Member States. The core business of ESF is conducted through the Policy Committee to which each member of the ESF nominates a delegate. The preparatory work for drafting ESF positions is undertaken within the Policy Committee. Unlike most European associations, where companies can intervene only via a national association, ESF member companies can participate directly in the policy-making of ESF and the drafting of ESF positions, allowing them to voice their priorities, issues and concerns. ESF is considered a valuable partner by the European Administrations because it is only by personal commitment from the Chief Executive Officer (CEO) – or at least of a member of the Board – that a company becomes a member of ESF. Involvement at the highest level of the members’ companies adds value to the interventions of the network. The CEOs become members of the “European Service Leaders Group” (ESLG). The ESLG does not meet in plenary sessions but the ESF arranges periodic meetings to discuss EU trade policy with the EU Trade Commissioner, other EU Commissioners, or EU Trade Ministers, and other countries Trade Ministers. At each Policy Committee meeting, officials from the Services Unit of the Directorate General for Trade of the European Commission are invited to brief ESF members on the latest developments on the services negotiations. The ESF secretariat also organises ad-hoc meetings on specific topic for interested members with the relevant officials. Newsletters are regularly sent out to keep members informed of any new development, study or information. ESF members are also invited once or twice a year to be part of an ESF delegation to the WTO Secretariat in Geneva and to present ESF priorities to WTO member delegations. The broad membership of ESF enables meetings with ambassadors and senior officials from of WTO member countries to be arranged efficiently and effectively. For further information and membership applications, please contact Pascal Kerneis, ESF Managing Director.